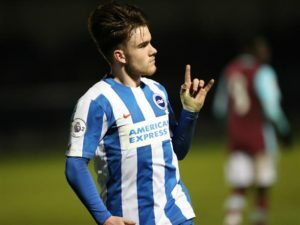 This week we spoke to Brighton and Hove Albion’s rising star Aaron Connolly. 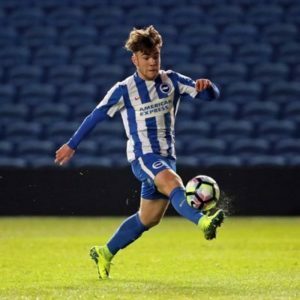 The Galway man will celebrate his 17th birthday later this month and has been in sensational goal-scoring form for Brighton’s U18 and U23 team in recent weeks. Eire Guide: It’s been an incredible week for you, scoring in the FA Youth Cup last Friday night and then netting a brace for the U23s against West Ham on Monday night. Your form is catching the attention of Brighton and Irish fans alike. Can you describe the last week for us and how it felt to make such a significant impact? Aaron Connolly: It’s been a great week for me personally but also for the U18s and U23s – the boys were quality in both games. I might be getting the headlines for the goals, but it’s the team that’s getting me the chances and thankfully I’m putting them away. EG: You signed for Brighton last summer from Mervue United. How have you found the transition to being a professional footballer? AC: I moved over here 6 months ago and I can’t thank Mervue enough for what they did for me over the years. The transition was tough at the start but now I’m getting used to it and starting to find my feet here. EG: Richie Towell recently spoke to an Irish radio station about the high quality facilities and coaching that are available at Brighton. How important were the facilities and club infrastructure in deciding to join Brighton? AC: Obviously the plans of the club and the facilities were a massive influence, but it was also the way the coaching staff treated me while I was over here on trial. That made my mind up for me because it’s such a family club, which you can see from the first team right through to the academy. EG: There seems to be an Irish revolution going on at Brighton at present, with Chris Hughton, Shane Duffy, Richie Towell and the two Waterford lads (Dessie Hutchinson and Jay Molumby). Do you feel this has helped with settling in to your new surroundings and progressing so quickly to the U23 team? AC: Yes, the amount of Irish players at the club is brilliant and has helped me a lot. It has been easy to settle in with the U18s and more importantly with the U23s last night and having the Irish lads there was a massive help. They have been first class with me and not just the Irish lads, but the whole team has been brilliant. Having a player of Liam Rosenior’s calibre playing with you is always a help and he is brilliant with all the younger players. EG: As a Galway man, it won’t have escaped your attention that you’re one of a group of Tribesmen that are having quite an impact cross-channel. Ryan Manning recently broke into the QPR first team, whilst Preston North End is home to Greg Cunningham and now Daryl Horgan following his stellar season with Dundalk. What do you see as the reasons for the emergence of so many footballers from Galway in recent seasons? AC: Football in Galway has always been good, but it hasn’t got the recognition it has deserved until now with Ryan in QPR’s first team. Greg is an established professional and has been a great player over the past few seasons and is brilliant with me personally as well. Also Daryl Horgan has been brilliant in the League of Ireland and got his move, which shows the way Irish football is developing. EG: Mervue United clearly played an important role in your development. Tell us a little about when you joined the club and your development in the Galway and District League ? AC: I joined Mervue when I was 11 and knew that the club was special and they have been brilliant for me. My manager all the way up, Damien Brennan was first class with me – not only as a coach but I knew I could speak to him about anything which also helped my performance on the pitch through the years. I can’t thank all the coaches who’ve worked with me all the way up enough. I played in the Kennedy Cup for Galway and we had a brilliant tournament finishing 5th, which was a great achievement. Playing against the best players in the country every weekend with Galway DL helped me toughen up and develop as a player. EG: You spent much of last year playing for Mervue in the new Airtricity U17 League where your goal scoring was prolific. How important is the new U17 league as a stepping stone for young Irish players that aspire to having a football career in the League or Ireland or cross-channel? AC: I played in the U17 League of Ireland when I was 15 with Ollie Neary as our manager and we had a brilliant season on and off the pitch. The boys in that team were excellent and we could have the banter off the pitch as well, which was exactly what a successful team needs. Unfortunately we missed out on the final that year losing in the semi-final to a strong St Patrick’s Athletic team. Personally it was a great season for me scoring 18 goals and also as a team it was a great season. EG: For those that follow Irish underage football, you’ve been on the radar since Tom O’Connor’s Ireland U16 squad won the Mayo International Cup in 2015 where you were named Player of the Tournament. Firstly, how did it feel to wear the Ireland jersey and secondly, how important was that tournament in getting noticed by cross-channel clubs such as Brighton? 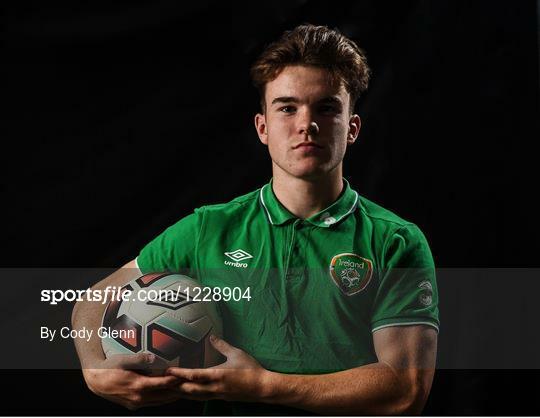 AC: Yeah Colin O’Brien was the U15 manager and he selected me for my first international game against Poland and it was the proudest moment of my life putting on that green jersey. Tom managed us at U16 level for a brief spell and we won the Mayo International Cup with great team performances and personally it was a great tournament for me. Brighton actually spotted me playing in the tournament and I went over there a few weeks later and loved every minute of it and thankfully I made the right choice to sign here as it’s a great club. After Tom stepped down Paul Osam and James Scott took over and it was a pleasure to play under them as they were brilliant with us. They were serious when they needed to be and they’d have a laugh and a joke when it was the right time, so it has been a pleasure working with all the coaches over the years at international level. Aaron is one of several Irish players thriving at Brighton. EG: The Irish U17 team will be in action again in March as part of the Elite Qualifying Phase for the European Championships. On the face of it, the draw appears favourable with the group containing Cyprus, Slovakia and the Faroe Islands. How do feel about Ireland’s prospects of making the finals tournament in Croatia? AC: It’s a great feeling to play for Ireland in any competition – friendly or competitive – and we have been brilliant this year. With the group we were drawn against we can’t take it lightly as they have gotten here by beating good teams. In saying that I’m very positive about our chances of qualifying and getting to the European Championship Finals. We have a great togetherness in the team as well as a great coaching staff backing us up with Colin (O’Brien), Keith (Andrews) and all the rest. EG: The last time the Irish U17s made the European Championship Finals was two years ago and from that team Connor Ronan has since gone on to make his mark as part of the Wolves first team. How quickly would you hope to progress to first team football and what areas of your game do you feel you need to work on to get there? AC: For me it’s just one step at a time and scoring 2 goals on my debut for the U23s is an incredible feeling. The only way that I can break into the first team is if I keep this standard going and work hard with the U18s firstly and then hopefully get my chances at U23 level more often. But for now I’ll focus on the U18s and if I get my chance again at U23 level, well hopefully I can make the most of it and keep doing so. EG: With the lack of striking options at senior level for Ireland there may be a clamour for you and the likes of Glen McAuley at Liverpool to make the leap earlier than usual. Have you thought much about being part of the Irish senior squad in the future? EG: Who are your heroes in football and is there a particular player that you model your game on? AC: As a striker I’ve always admired Thierry Henry. His pace, his movement and his eye for goal are second to none in this modern game. I love watching players like Aguero, Torres and Luis Suarez as they are world class players and I like to pick up little bits of their games by watching them week in week out. EG: If you were to give one piece of advice to a young player starting out what would it be? AC: Attitude is everything and it’s not all about talent at the highest levels. It’s about keeping your feet on the ground when you’re on a high and about keeping your head up when you have a bad day because in this game there will be more lows than highs and it’s all about that mental strength. That’s something my parents have always told me and they have played the biggest role in my career so far because without their backing and support I definitely would not be where I am today. We would like to thank Aaron for taking the time to speak to Eire Guide. He’s clearly a very grounded young player and we wish him all the very best for the rest of the season with both Brighton and the Ireland U17s. Previous Post Preview: Serbia v Ireland – How Good Are The Serbs? Great interview and comes across as a very grounded young man. Well done to Mervue also for being a great club that will always produce fine players.